In 2015, 12 years after the events of "Patlabor 2 the movie", people sympathetic to the ideals of Yukihito Tsuge (currently in prison for the attempted coup d'etat on Tokyo in 2002) steal a AH-88J2 Hellhound, the Grey Ghost, a stealth attack helicopter from the Japanese Self Defence Force (JSDF) and fire a missile into the Rainbow Bridge in Tokyo, echoing the attack on Yokohama Bay Bridge in 2002. Captain Gotoda of the SV2 is once again visited by Kei Takahata of Public Security forcing him to help defeat the terrorists. Shinobu Nagumo, Gotoda's senior and mentor, returns to Japan in secret from her overseas stint with the UNHCR in the middle east to contact him and explain her and Captain Gotoh's disappearance after Tsuge's failed coup d'etat. The terrorists attack Tokyo with the Grey Ghost with JSDF pilot Rei Haibara on board, whose data has been erased from all official records. 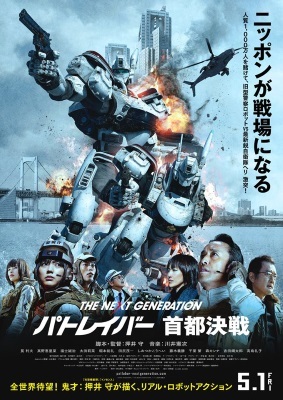 This film is the concluding chapter in the "The Next Generation - Patlabor -" series. While it is more of an action/drama than the preceding movie series, there still is quite a bit of comedy in the film, though toned down compared to the series. The film is essentially a remake, sometimes shot for shot of "Patlabor 2 them movie". Yoshiko Sakakibara returns to play Shinobu Nagumo, however is only seen with her back turned to the camera or in silhouette. Mamoru Oshii appears in a cameo with his Basset Hound at the 20 minute mark of the original theatrical cut. It was the first Japanese film to use Dolby Atmos audio technology. Upon release in Golden Week of 2015, it was considered the biggest box office failure of the year, only reaching the 12th spot in the film rankings of that week. Regardless, the Tohokushinsha Film Corporation pushed on and released a "Director's Cut Edition" five months later on 10 October 2015. This version contained an additional 27 minutes worth of new footage. Two new major scenes include the SV2 having a meal at a Hot Springs resort while discussing the Rainbow Bridge bombing and an additional scene where Kei Takahata reveals information she has discovered about Rei Haibara's childhood. There are a number of extended scenes including Ohtawara and Kasha brawling on the beachfront with local thugs and an extended lunch scene at the SV2 where Yamazaki is horrified by a pig on a spit brought in by the Shanghai Restaurant. Hong Kong company Panorama has released the original theatrical release on DVD and Blu-ray disc and the Director's Cut Edition on Blu-ray disc only. The discs include the original Japanese dialogue, a Cantonese dub and English and Traditional and Simplified Chinese subtitles. The DVDs and Blu-rays are only available in Hong Kong, and therefore will only work on NTSC compatible and region 3 compatible DVD players and region A Blu-ray players. If you don't live in Hong Kong, check your DVD or Blu-ray player's instruction manual to see if it will play them) Please see the English Language Live Action Releases Video List for a complete listing of all releases, formats and product specifications for this series. This series is available as single DVD and Blu-ray discs in Japan from Happinet Pictures. These DVDs and Blu-rays do not come with English subtitles or an English dub. The DVDs and Blu-rays are only available in Japan, and therefore will only work on DVD and Blu-ray players that are both NTSC compatible and will play region 2 DVD discs (the Blu-rays are region free - if you don't live in Japan, check your DVD player's instruction manual to see if it will play the discs). Please see the Japanese Live Action Related Releases Video List for a complete listing of all releases, formats and product specifications for this series. A GWEI Product. ©2003 - 2018 GWEI. The Next Generation - Patlabor - Final Battle in the Capital ©2015 Headgear/The Next Generation - Patlabor Production Committee. All other logos/trademarks are copyright of their respective owners/companies. Used for review and illustration purposes only.